Increasing global temperatures are likely to have major impacts on agriculture, but the effects will vary by crop and location. This paper describes the temperature sensitivity and exposure of selected specialty crops in California. We used literature synthesis to create several sensitivity indices (from 1 to 4) to changes in winter minimum and summer maximum temperature for the top 14 specialty crops. To estimate exposure, we used seasonal period change analysis of mid-century minimum and maximum temperature changes downscaled to county level from CMIP5 models. We described crop vulnerability on a county basis as (crop sensitivity index × county climate exposure × area of crop in county); individual crop vulnerabilities were combined to create an aggregate index of specialty crop vulnerability by county. We also conducted analyses scaled by crop value rather than area, and normalized to total specialty crop area in each county. Our analyses yielded a spatial assessment highlighting seasons and counties of highest vulnerability. Winter and summer vulnerability are correlated, but not highly so. High-producing counties (e.g., Fresno County in the San Joaquin Valley) are the most vulnerable in absolute terms, while northern Sacramento Valley counties are the most vulnerable in relative terms, due to their reliance on heat-sensitive perennial crops. Our results illustrate the importance of examining crop vulnerability from different angles. More physiological and economic research is needed to build a comprehensive picture of specialty crop vulnerability to climate change. This article is part of a Special Issue on ‘Vulnerability of Regional Forest and Agricultural Ecosystems to a Changing Climate (USDA Southwest Climate Hub)’ edited by David Gutzler and Connie Maxwell. The online version of this article (doi: 10.1007/s10584-017-2011-3) contains supplementary material, which is available to authorized users. In California, specialty crops—defined by the USDA as all fruits, nuts, vegetables, and nursery crops—account for the majority of agricultural value. To date, efforts to understand the effect of climate change on crop production have focused mostly on field crops (e.g., grains, dry beans, and oilseeds), which provide the majority of calories consumed by humans; however, specialty crops are crucial for adequate nutrition and dietary diversity. This study aims to contribute to the growing body of literature on climate risks to specialty crop production in the USA. Specifically, we examine at the county scale where California specialty crop production is most vulnerable to increasing winter minimum and summer maximum temperatures. Specialty crops present a modeling challenge because of their diversity. They are from different botanical families; they are annuals, biennials and perennials; they are consumed as fruits, nuts, leaves, stems, and tubers; and they employ a wide range of cultivation practices. The USDA recognizes 208 different specialty crops, not including nursery crops (Agricultural Marketing Service 2014). In this assessment, we limited our analysis to California’s top 14 specialty crops by value (Table 1): grapes, almonds, strawberries, lettuce, walnuts, citrus, pistachios, tomatoes, broccoli and kin, stone fruit, carrots, melons and cucumbers, onions and garlic, and avocados. We considered crops in the same species together, crops in the same genus either together or separately depending on their cultivation, and crops in different genera separately. Together, these 14 crops accounted for 88% of specialty crop value in California in 2012 (Online Resource 1, Fig. S1). We chose to focus on California because it accounts for more than half of specialty crop production nationwide. For many specialty crops, such as wine grapes, strawberries, leaf lettuce, garlic, and broccoli, California’s share approaches or exceeds 90% of US production (Starrs and Goin 2010). This dominance is due to California’s Mediterranean climate (unique in North America), in combination with large-scale delivery systems for irrigation water. The largest production centers are California’s Central Valley and arable coastal regions. Despite increasing attention on potential impacts of climate change on specialty crops in the past decade, especially in California, many questions remain. There are several obstacles to creating a comprehensive picture of how specialty crops will fare under future climatic conditions, including (1) the diversity of specialty crops and their cultivation practices; (2) the uncertainty of climate change impacts on water resources at a regional scale; (3) the interaction of climate with other stressors such as pests and disease; and (4) uncertainties in adaptive capacity, for example, the economic feasibility of shifts in cropping patterns. One of the best-studied aspects of this problem is how increasing temperatures (specifically, winter Tmin) may harm perennial crops that depend upon a minimum number of accumulated chill-hours to achieve optimum yields: for example, almonds, walnuts, pistachios, and stone fruit. This is of particular concern because Tmin is increasing significantly faster than Tmax in California (Cordero et al. 2011). Several studies have combined climate model output with historically observed temperature-yield relationships to conclude that by mid- to late century, most current locations of perennial specialty crop production in California will no longer be climatically suitable for many key crops (Lobell et al. 2006; Baldocchi and Wong 2008; Luedeling et al. 2009; Lobell and Field 2011; Hannah et al. 2013; Baldocchi and Waller 2014). For annual crops, temperature-yield relationships are more complex, including both negative effects (e.g., yield losses caused by higher nighttime respiration) and positive effects (e.g., longer growing seasons). Modeling studies have produced mixed results (Lobell et al. 2007; Deschenes and Kolstad 2011; Lee et al. 2011; Lee and Sumner 2015), with some crops such as melons and tomatoes projected to expand their area of cultivation. Predicting how changes in precipitation and/or water availability may affect specialty crop production in California is even more complex than predicting temperature effects, not only due to the inherent difficulty in modeling precipitation, snowpack, and runoff at a regional scale (Pierce et al. 2013) but because available water for California crops depends greatly on infrastructure and policy. The large majority of specialty crop area in California is irrigated, and approximately half of this irrigation is supplied by groundwater (Cooley et al. 2015). Thus, unlike rainfed agriculture, California specialty crops would not be expected to respond dramatically to precipitation changes in the short to medium term. In fact, in 2014–2015, which was an extreme drought year with a statewide precipitation deficit of 48%, total crop and livestock production in California each fell by less than 3%, due in part to increasing reliance on groundwater (Howitt et al. 2015). Much work has been done and is underway to assess how climate change will affect water resources in California and across the Southwest (CCTAG 2015; Dettinger et al. 2015). Though predicted changes in the total amount of precipitation are currently equivocal, modeling studies consistently show that climate change will significantly increase potential evapotranspiration in California’s specialty crop growing regions, and that changing irrigation practices can partly but not wholly compensate (Purkey et al. 2008; Joyce et al. 2011; Mehta et al. 2013). These analyses generally use a high degree of aggregation (e.g., grouping all annual crops together), so the effect of changes in water supply and demand for each particular crop remain to be explored in more detail. Even more challenging is predicting how climate change may affect specialty crops via changes in extreme events and pest and disease pressure. A serious adverse weather event (Lobell et al. 2011) or widespread pest outbreak (Trumble and Butler 2009) can have consequences in the tens of millions of dollars for California agriculture, but forecasts of climate-driven changes in these events remain highly uncertain. For example, some crop pathogens are favored by warm temperatures, others by cool temperatures; and pathogens respond differently to precipitation depending on its exact timing. Climate change may increase or decrease weed competitiveness, depending on many factors (Korres et al. 2016). Informed by this diversity of previous efforts, we take a somewhat different approach. Most agricultural planning and advising happens on the county scale—for example, University of California Cooperative Extension crop advisors are county-based. USDA agricultural statistics are generally collected at the county scale, and commodity boards (such as the Almond Board of California) also tend to organize resources and outreach on a county basis. Thus, a county-by-county map of specialty crop climate vulnerabilities can help prioritize future research and adaptation efforts. Due to the inherent difficulties in predicting how specialty crop production will be affected by changes in precipitation, water availability, extreme events, and pests and diseases, we chose to focus our analysis on the spatial variability of temperature effects. Instead of quantifying impacts per se, we aim to highlight which counties and which production systems may most benefit from further research and/or adaptation assistance. We acknowledge that temperature is only one aspect of climate change; nevertheless, temperature changes may have profound effects on California specialty crop production. The basis of our analysis is a relative ranking of temperature sensitivity (specifically, sensitivity to summer Tmax and winter Tmin) of California’s top 14 specialty crops. Table 2 summarizes our literature review on the temperature requirements of each crop (divided into perennial and annual crops, and therein listed in descending order of 2012 value). Online Resource 2 provides more detail. Based on this review, and on consultations with California specialty crop experts (Acknowledgements), we categorized crops with regard to their temperature sensitivity (Table 1). Table and wine grape yield may be relatively unchanged by 2 °C T increase (Lobell et al. 2006; Lobell and Field 2011), but T affects fruit quality in wine grapes (Nicholas et al. 2011). Area suited for high-quality wine grapes may decrease 70% by 2050 (Hannah et al. 2013). Lower chilling requirements (200–400 h) than other Prunus, thus may remain productive in many parts of the Central Valley (Luedeling et al. 2009), but winter fog loss is an important unknown (Baldocchi and Waller 2014). High chilling requirement (800–900 h); Central Valley may no longer be suitable by late century (Luedeling et al. 2009) unless lower-chill cultivars are developed (Kallsen et al. 2009). Pistachios bear in alternate years, making modeling difficult (Lobell et al. 2007). Subtropical; can be killed by frost. May benefit from warm winters. Lobell et al. (2006) predicted that summer warming will decrease CA avocado yields 45% by 2060, based on historical correlations, but the mechanism for this is not understood (Lobell et al. 2007). Perennial grown as annual; bears in summer but prefers cool coastal climate. Lobell and Field (2011) predicted climate change would decrease CA strawberry production 10% by 2050, while Deschenes and Kolstad (2011) anticipated a 43% decline by 2070. Cool-season annual; narrow optimal temperature ranges around 18 °C (Daugovish et al. 2008; LeStrange et al. 2010). Deschenes and Kolstad (2011) say CA broccoli production could increase by 39% by 2070, due to warmer winters and northward range expansion. Cool-season annuals that achieve optimal growth between 20 and 25 °C (Smith et al. 2011). Few data exist on their climate vulnerability. Each crop was assigned two independent sensitivity rankings: one for changes in summer Tmax and one for changes in winter Tmin, on a scale of one (low sensitivity) to four (high sensitivity) (Table 1). Although the sensitivity rankings (1–4) have no direct physical interpretation, we made sure to give similar crops similar scores, and we aimed to place roughly one-quarter of the crops into each of the four categories. Effects on both crop yield and quality were taken into account: for example, a summer heat wave may cause flower abortion and subsequent low yield in tomatoes (Ozores-Hampton et al. 2012), while in lettuce, it may cause bitterness and unmarketability (Smith et al. 2011). If a predicted temperature change may benefit a crop (e.g., less freeze damage to citrus), we nevertheless designated that crop “low sensitivity,” because we define “sensitivity” as potential for harm. In practice, a crop’s sensitivity depends upon whether a given temperature change falls within or outside the crop’s optimum range. That may depend on where the crop is grown. For example, tomatoes are heat-resistant, but they are already grown in areas with high summer Tmax, so they may be vulnerable. We attempted to account for this when choosing these subjective sensitivities. The approximate and ordinal nature of the sensitivity rankings (1, 2, 3, 4) compelled us to test whether our results depended on choice of numerical scale. As shown in Online Resource 1 (Figs. S5-S11), we repeated the calculations with an “expanded” sensitivity scale (0.5, 1, 2, 4) to exaggerate differences between crops and a “condensed” scale (2.5, 3.0, 3.5, 4.0) to minimize differences. We grounded our analysis in basic data from the most recent USDA Census of Agriculture (NASS 2014), including county-by-county data on bearing acres of each of the 14 specialty crops we considered. We examined each of California’s 58 counties (only four of which do not have significant specialty crop production), plus one county in Arizona (Yuma County) that is a major producer of specialty crops and has similar climatic characteristics to adjacent Imperial County in California. We performed three calculations for each county: exposure to temperature increase; crop sensitivity to increasing temperatures; and finally the potential impact of temperature increase, according to the total crop acreage or crop value that will be exposed to the changes. We calculated the exposure of each county to climate change using projected future temperatures for 2040–2069. We used temperature projections from 20 general circulation models of the Coupled Model Intercomparison Project 5 (CMIP5) using the Representative Concentration Pathway 8.5 (RCP 8.5) (Abatzoglou 2013). We focused on two temperature metrics: (1) change in summer maximum temperature (June, July, August), when many crops are vulnerable to heat stress and (2) change in winter minimum temperatures (December, January, February), especially relevant to perennial crops that require chill-hours (cumulative hours below 7.2 °C) for optimum yields. We used the downscaled temperature projections of the Multivariate Adaptive Constructed Analogs (MACA) data product (Abatzoglou and Brown 2012). The 4-km grid of temperature changes was aggregated to the county level for each season by calculating the mean temperature change of the pixels composing each county. To estimate which specialty crop-producing counties are likely to be most impacted by changing temperatures, we multiplied each county’s overall sensitivity by its temperature exposure and total specialty crop acreage (and, to create a value- rather than area-based result, also by value per acre). This was then summed for 14 crops in each county to yield a dimensionless ranking of “absolute impact” by county (Eqs. 3 and 4). The absolute impact numbers were then normalized by specialty crop acreage or value in each county to calculate a complementary metric, “relative impact” (Eqs. 5 and 6). We grouped these results for all 55 counties using Jenks Natural Breaks on a scale of 1 (low) to 5 (high). Using these components in our calculations allows us to examine regional vulnerability from several different angles: by acreage and by value, in an absolute sense, and relative to the amount of specialty crop area in the county. Overall, this builds a multifaceted picture of how changing temperatures may affect the region’s agriculture. For example, acreage is the most relevant metric when considering ecosystem services of crop production, while crop value becomes relevant in a cost-benefit analysis of adaptation options. Likewise, the absolute impact of rising temperatures is relevant in state-level planning, while a disproportionately large relative impact in a county will be of special concern to the affected population—especially for counties that derive much of their economic output from specialty crops (Fig. S4). To supplement the color-coded results maps, we provide an appendix of county-by-county numerical results (Online Resource 3) and a map with county names to aid interpretation (Fig. S3). Predicted increases in summer maximum temperature were moderated by proximity to the Pacific Ocean; coastal counties generally saw a ~2 °C increase in summer Tmax by 2040–2069, while inland and mountain counties saw a nearly 3 °C increase. Central Valley counties had a summer Tmax increase of roughly 2.5 °C. Exposure to increases in winter Tmin were generally similar in pattern but greater in magnitude (2.5 °C on the coast to 4 °C in the mountains), and the inland desert counties Imperial and Yuma experienced disproportionately greater changes (Fig. S2). Dynamics of coastal fog are complex and are not always well represented by climate models (O’Brien et al. 2012), so the results for coastal counties (especially for winter Tmin) should be considered somewhat uncertain. On an acreage basis, Plumas, Butte, Yuba, and Santa Cruz Counties had the highest sensitivity to changes in summer Tmax. The top 10 most sensitive counties also included Monterey (notably ranked no. 3 in total specialty crop production) and Yuma (ranked no. 10). For winter Tmin sensitivity, the Central Valley figured prominently: 9 of the 10 top-ranked counties were in the Central Valley (mostly the Sacramento Valley), compared to only 5 of 10 counties for summer Tmax. Normalizing by crop value rather than area caused only minor changes in county ranking (Fig. 1). Value-based calculations slightly highlighted several counties producing high-value strawberries (such as Orange and Ventura Counties in Fig. 4d), but otherwise, trends were similar. Because we defined “absolute impact” as a function of total specialty crop acreage in each county, the largest absolute impacts were seen in the counties with the greatest specialty crop production. The highest absolute impacts were seen in the San Joaquin Valley (especially Fresno and Kern Counties, respectively the first and second-ranked specialty crop-producing counties) and the Central Coast (especially Monterey, the third-ranked county). This pattern was seen both in winter and summer, for both area-based and economic impact (Fig. 2). Because we normalized “relative impact” by total specialty crop acreage in each county, the relative impact results highlighted counties with particularly sensitive specialty crops and/or particularly extreme temperature changes (Fig. 3). In our area-based calculations, the relative impact of summer Tmax changes was most pronounced in the northern Sacramento Valley (Plumas, Butte, Yuba, and Shasta Counties). Area-based impact of winter Tmin changes followed a broadly similiar pattern but with large impacts also seen further south in the San Joaquin Valley (especially Madera and Stanislaus Counties). No counties ranked in the top 10 for both absolute and relative impacts of summer Tmax; however, there were five counties that appeared on both the absolute and relative top 10 list for winter Tmin: Glenn, Stanislaus, Sutter, Madera, and Merced. Most counties had winter impacts that were greater than or equal to summer impacts. For example, the southern counties of the Central Valley exhibited higher potential impacts for winter than summer, while the northern counties of the Central Valley had similar impacts in summer and in winter. We calculated correlations between our different metrics in order to clarify their interdependence and visualize differences between them (Fig. 4). We calculated both Pearson R2 (used for continuous data) and Spearman’s ρ (used for rank values). These produced comparable results (Fig. 4), showing that the relationship between different impact metrics did not closely depend on whether the crop sensitivity numbers are interpreted as ordinal versus interval. The correlation between absolute impact and specialty crop acreage was very strong (e.g., R2 = 0.97 for summer area-based impact). However, there was little correlation between absolute impact and relative impact (e.g., R2 = 0.37 for winter area-based impact; data not shown). Correlation between sensitivity and relative impact was strong but with some variability (e.g., R2 = 0.86 for summer area-based). Correlation between area-based and value-based metrics was fairly tight (e.g., R2 = 0.98 for summer sensitivity), but with some slight outliers due to the high value of strawberries. Finally, the correlation between summer and winter metrics was positive and moderately strong (e.g., R2 = 0.50 for area-based sensitivity). The slope of these lines, indicating the ratio of summer to winter impacts, was less than unity (e.g., slope = 0.71 for area-based sensitivity). This analysis demonstrates several different approaches to estimating crop vulnerability that are spatially explicit at a scale relevant to growers, farm advisors, and state and local policymakers; are straightforward enough to be widely used and interpreted; and are underpinned by detailed data on temperature responses of diverse crop species. Below, we explore some mechanisms underlying our results. Area-based summer sensitivity results are dominated by heat-averse crops in the coastal counties (strawberries, lettuce, broccoli) and the Sacramento Valley (almond and walnut trees) (Fig. 1). Winter sensitivity results highlight the San Joaquin and Sacramento Valleys, where nut trees and stone fruit are vulnerable to a loss of winter chill-hours. For example, Fig. 4c shows Glenn and Madera counties (dominated by almonds, pistachios, and walnuts) with among the highest winter sensitivies, while San Diego (dominated by avocadoes) is among the lowest. These patterns persist under a value-based analysis. Absolute impact values (Fig. 2) are largely determined by specialty crop acreage, but several counties depart from expectations (Fig. 4a). For example, for summer area-based impact, Kern County falls below the line, due to its prevalence of citrus and table/raisin grapes, each of which have a summer Tmax sensitivity of 1 (low). By contrast, Monterey County falls above the line: it is the state’s largest producer of cole crops and strawberries, each of which has a summer Tmax sensitivity of 3. The relative impact results resemble the sensitivity results but are modulated by projected temperature changes: for example, the coastal counties’ high sensitivity does not translate into high relative impact, because temperature changes on the coast will be consistently mild. This can be seen in Fig. 4b, where coastal Santa Barbara County has a lower-than-expected relative impact, while inland mountainous counties Plumas and Modoc have higher-than-expected impacts. In the area-based relative impact results, differences emerge between summer and winter (Fig. 3): summer impacts are concentrated in the northern Sacramento Valley, perhaps due to heat-sensitive stone fruit and almonds (each with a summer Tmax rating of 3), whereas in the winter, the whole Central Valley is equally at risk. Second, the use of subjective temperature sensitivity metrics for each crop (on a scale of 1 to 4) prioritizes simplicity and ease of interpretation, but a single integer cannot fully describe a crop’s climate response. For example, Lobell and Field (2011) found that warmer February nights led to a shorter blooming window for almonds, which reduced pollination success, which reduced yields. Despite these limitations, we attained fundamentally consistent vulnerability results even using different numerical sensitivity rankings (Online Resource 1). Thus, we propose that county-by-county impact ranking can be used to help prioritize creation of more objective and detailed outputs, such as changes in crop yields (tons/acre) or net impact on the county economy. Because accurate prediction of particular effects is difficult, flexible solutions are essential. Our analysis did not attempt to model adaptation capacity, but for many California crops, a variety of adaptation options are available (California Department of Food and Agriculture 2013). Highly managed agroecosystems have inherent adaptation advantages over natural ecosystems; for example, crops have been bred for climatic stress tolerance, and this breeding can be further targeted in the future. To our knowledge, this is the first statewide spatial temperature vulnerability analysis of California’s top annual and perennial specialty crops based on their physiological characteristics. Jackson et al. (2012) performed a spatially explicit statewide analysis, but they used total acreage of each crop as a proxy for its climate sensitivity. Lobell et al. examined impacts of historical climate (2007) and expected future climate (2006) on California’s top perennial specialty crops but did not present the information spatially. Lee et al. (2011) estimated future yield changes in major California crops but presented the results by latitude. Medellin-Azuara et al. (2011) predicted climate-driven acreage changes of California’s dominant crops, but they aggregated the state into four regions. Lee and Sumner (2015) focused only on Yolo County. We suggest that our results present a useful assessment of potential temperature impacts on specialty crops, spatially summarized for agricultural stakeholders. Our results and conclusions concur with the above work in many ways: there is no single locus of agricultural vulnerability in California; different crops respond in markedly different ways; and chill-sensitive perennial crops in the Central Valley are of special concern. However, the choice of metric (relative versus absolute, winter versus summer, and area- versus value-based) influences the spatial pattern of specialty crop vulnerability. Although perennial specialty crops have attracted the most attention so far (Luedeling et al. 2009; Lobell and Field 2011; Nicholas and Durham 2012), heat-sensitive annual crops (especially strawberries, cole crops, and lettuce) are a strong driver of vulnerability in California’s coastal counties. Using crop sensitivity and economic value to create a spatial ranking of potential climate change impacts can help prioritize which regions to examine more rigorously. 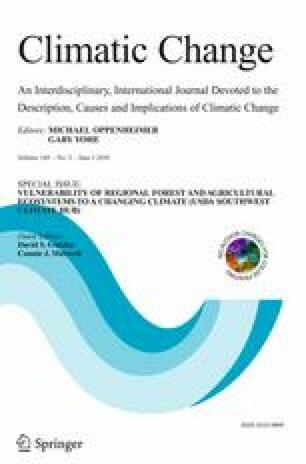 More in-depth analysis could combine projected climate change conditions with dynamic economic models and crop physiological constraints to construct climate change adaptation scenarios and examine their resilience, similarly to Lee and Sumner (2015) and Acosta et al. (2013). We observed a lack of published data on climate relationships for many of these crops in California—notably onions, garlic, carrots, and avocados. A database aggregating known climate relationships for specialty crops would be useful. Ideally, such data would include crucial aspects of crop quality as well as yield (Ahmed and Stepp 2016) for sensitive crops such as wine grapes (Duchene et al. 2010). These data could inform qualitative investigations of vulnerability and help parameterize quantitative, process-based simulation models to predict the growth and yield of specialty crops under different conditions. For most specialty crops, such models do not currently exist. In the future, specialty crop simulation models could play a role in large-scale integrated modeling projects such as AgMIP (the Agricultural Model Intercomparison Project; www.agmip.org), which currently includes almost exclusively cereals and pulses. Another knowledge gap is the interplay of climatic and economic forces in California. For example, because melons are heat- and drought-tolerant, they could replace more sensitive crops such as cherries and almonds (Jackson et al. 2011). However, consumer demand for melons is static and inelastic, so increasing melon production may lead to price crashes or unsold product (T. Hartz, pers. comm., 22 December 2014). As another example, one might expect rising temperatures to harm strawberries most in already-warm Southern California, but warmer temperatures could actually boost Southern California strawberry yields in winter, when prices are highest (O. Daugovish, pers. comm., 7 January 2015). This underscores the need to consider both climatic and economic effects whenever possible. Although our study does not explicitly include economic effects, we expect our results will still be useful to highlight particularly vulnerable counties that deserve in-depth economic modeling. On a related note, there is insufficient research on the role of climate in farmer decision-making in California (Nicholas and Durham 2012; Niles et al. 2013) and countrywide (Mase and Prokopy 2014). One California study suggested that farmers were more likely to pursue adaptation actions if they perceived climate change as being a proximate and relevant phenomenon, but many did not (Haden et al. 2012). A better understanding of how specialty crop farmers perceive and adapt to climate change—perhaps via surveys, interviews, focus groups, and case studies—will allow for more accurate analysis of impacts and appropriate interventions. Finally, development and validation of models that reflect crop-relevant interactions between changes in temperature and changes in water availability (in terms of direct effects on precipitation, and indirect effects via water supply and infrastructure) will facilitate development of climate adaptation strategies. Complex interactions are likely; for example, reducing Central Valley irrigation due to water shortages may exacerbate regional heat stress (Lobell and Bonfils 2008). Despite the uncertainties in how California agriculture will shift with a changing climate, the industry will likely face significant climate-related constraints (Schlenker et al. 2007), and a timely understanding of future challenges will allow producers to select from a toolkit of appropriate adaptation measures (California Department of Food and Agriculture 2013). This work is a contribution of the USDA Climate Hubs (Southwest and California). Thanks are given to Amrith Gunasekara, Carolyn Cook, Casey Walsh Cady, Tapan Pathak, Mark Battany, and Robert Tse for reviewing drafts; Dave DeWalt for help with statistics; and Alexandros Xides for data entry. Thanks are also due to the following experts who reviewed crop-specific sections: Malli Aradhya, Greg Browne, Eli Carlisle, David Crowley, Oleg Daugovish, Louise Ferguson, Tim Hartz, Dan Kluepfel, Bruce Lampinen, Joe Nuñez, Carol Shennan, Richard Smith, Scott Stoddard, Dianne Velasco, and Larry Williams. We appreciate an anonymous reviewer’s thoughtful advice on statistics. Any errors or omissions remain the responsibility of the authors. EE conceived the analysis; AK and KS performed literature review; EE, JD, and AK procured quantitative data; JD, AK, NLB, and EE performed analysis and generated figures; AK, KS, JD, and EE wrote the manuscript. Online Resource 1 (DOCX 5124 kb). Online Resource 2 (DOCX 161 kb). Online Resource 3 (XLSX 339 kb).